All prices include delivery within a 20 mile radius of Quothquan (Including: Lanark, Carnwath, Abington, Leadhills, Broughton, Dolphinton, West Linton & Peebles) . Delivery 20-30 miles from Quothquan is an additional £10, and 30-40 miles is an additional £20. We deliver our wood in a tipping trailer which is a standard load holding approximately 2m3 or the trailer can accommodate a double load of 4m3. We typically provide a standard 10” log, however this length can be varied to suit your needs. Bulk loads can also be accommodated by tractor and trailer where there is suitable access. We aim to deliver loads within 4-5 days of your order but this does increase during the busy periods, especially over the Christmas break. To avoid running out of logs we recommend ordering a week in advance. We also deliver 6 days a week. All prices include delivery within a 20 mile radius of Quothquan (Including: Lanark, Carnwath, Abington, Leadhills, Broughton, Dolphinton, West Linton & Peebles). Delivery 20-30 miles from Quothquan is an additional £10, and 30-40 miles is an additional £20. 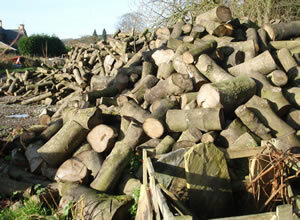 (please check our firewood information page before deciding which type of firewood to order). Payment is due on delivery by cash or cheque (made payable to DW Lyon Agricultural Contractors Ltd). Please contact us on 01899 308412 or Becky on 07799713058.